The New York Times bestselling author to whom Oprah gave her first ever "Chutzpah" Award, Irshad Manji writes a bridge-building book that is both a stirring reflection and a path to action. 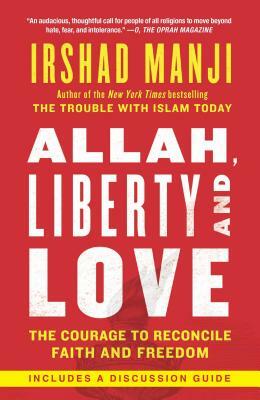 In Allah, Liberty and Love, Irshad Manji paves a path for Muslims and non-Muslims to transcend the fears that stop so many of us from living with honest-to- God integrity: the fear of offending others in a multicultural world as well as the fear of questioning our own communities. Since publishing her international bestseller, The Trouble with Islam Today, Manji has moved from anger to aspiration. She shows how any of us can reconcile faith with freedom and thus discover the Allah of liberty and love--the universal God that loves us enough to give us choices and the capacity to make them. Among the most visible Muslim reformers of our era, Manji draws on her experience in the trenches to share stories that are deeply poignant, frequently funny and always revealing about these morally confused times. What prevents young Muslims, even in the West, from expressing their need for religious reinterpretation? What scares non-Muslims about openly supporting liberal voices within Islam? How did we get into the mess of tolerating intolerable customs, such as honor killings, and how do we change that noxious status quo? How can people ditch dogma while keeping faith? Above all, how can each of us embark on a personal journey toward moral courage--the willingness to speak up when everybody else wants to shut you up? Irshad Manji is the author of the New York Times bestseller, The Trouble with Islam Today, and the creator of the Emmy Award-nominated PBS documentary, Faith Without Fear. She is Director of the Moral Courage Project at New York University's Robert F. Wagner School of Public Service. For more information: IrshadManji.com.